Great quality replacement windows will breathe new life into your home. They will reduce your energy bill, and they increase your home’s value. Our beautiful and well-engineered Xtreme Windows are made locally in Pennsylvania, and are crafted exclusively for HCR. Because we source locally, we have better control over the production process. This also means we usually have a shorter lead time to installation. Our windows are custom manufactured to our precise specifications. Every detail of performance, function, appearance and operation has been considered. The result is not just a beautiful window, but THE MOST ENERGY EFFICIENT window on the market. We are very proud to manufacture and sell our exclusive line of windows, the first to be backed by the Good Housekeeping Seal of approval. Significant testing and product applications are done by the Good Housekeeping Institute to achieve this status. Xtreme windows combine several high-tech coatings and an argon gas insulation barrier along to achieve both a beautiful clear glass look while delivering incredible insulating performance. 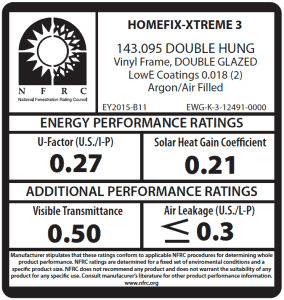 Check out the NFRC rating sticker – you just won’t find a lower U-Factor! 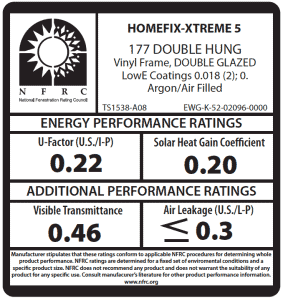 Xtreme-5 exceeds all ENERGY STAR qualifications and is eligible for a federal tax credit.